The most common snowboarding injury is to the wrist. This may be in the form of a fracture, dislocation, and/or ligament injury. 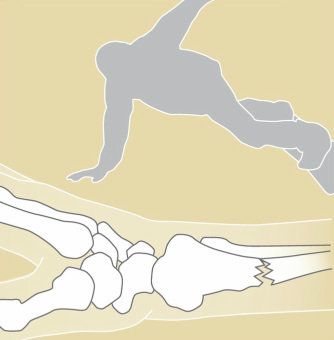 This usually occurs when the rider falls backwards or forwards and puts his or her hands out in front of himself or herself to brace the fall (see Figure 1). If you have this injury, your doctor should examine your wrist and possibly get more studies such as x-rays and/or an MRI or CT scan. Depending on the positions of the bones and the integrity of the ligaments, treatment may consist of a splint, cast, or even surgery. Occasionally special devices are needed such as metal pins, plates, screws, or a combination of devices to stabilize wrist fractures and/or ligament injuries. The chance of suffering a snowboarding injury may be decreased by using wrist guards or gloves that have guards built into them. There are medical studies that have shown such protective gear to be effective at decreasing the potential for injury. Regarding protective gear, helmets have also been shown to decrease head injury and their use should be encouraged.